Plenty of apps can track your weight. FatWatch will analyze it. You cannot control your weight if you aren't aware of how it is changing. Beyond recording the readings from your scale, FatWatch computes a moving average so that you can see the real trends behind the day-to-day shifts in your body weight. FatWatch estimates how much energy you are burning (or overeating) each day, giving you valuable information you can use to intelligently adjust your diet and exercise plans. It only needs your weight: there is no need to fuss with a food database every time you eat something. If you've already been tracking your weight, FatWatch allows you to import weight history from a variety of sources, including Eat Watch for Palm. You can also export to your Mac or PC and do with it as you please. No additional software is required. Want to learn more? Take a tour or get answers to some frequently asked questons. Tracks body fat ratio, if your scale supports it. Computes a moving average, and analyzes the trend. 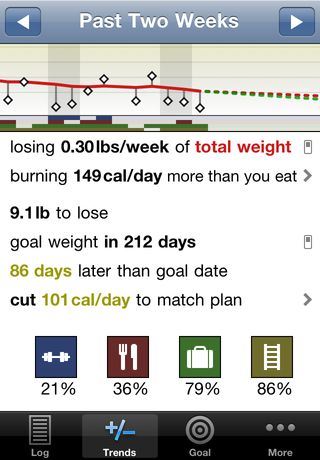 Annotate your weight history with notes and check marks. Passcode protection keeps your weight history private. Optional Body Mass Index (BMI) color coding. Choose pounds, kilograms, or stones for weight; calories or kilojoules for energy; scale precisions of 1.0, 0.5, 0.2, 0.1, or 0.05. Import or export your weight as a comma separated text file. Uses statistical methods described in The Hacker's Diet, but applicable to any diet or exercise plan.